Georgina Cassar... threefold support at the London Games. Representing one’s country in the Olympic Games is a dream for all athletes. Having a wider base in terms of dual nationalities creates a bigger hype. 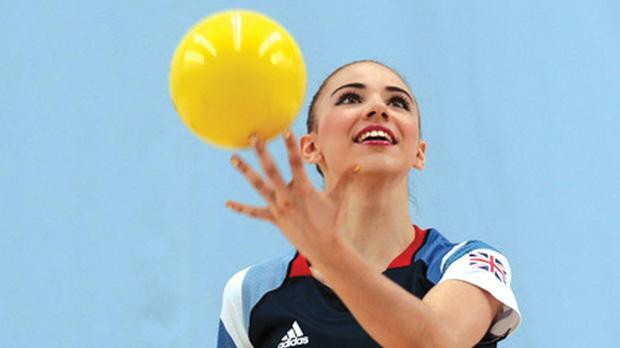 Alex Vella talks to Georgina Cassar, a GB gymnastics team member and discovers more. Georgina Cassar is the latest name of Maltese stock to appear on the stage of world sports. She was recently selected to represent Great Britain in rhythmic gymnastics at the London Olympics, the first time ever a British team has qualified for the Olympic Games in this discipline. The second of three female siblings, Georgina, 18, and born of a Maltese father, Franco Cassar Loporto, and an English mother, Jackie, is an up-and-coming star in a sport which combines rhythmic skills of the highest order coupled with aesthetic qualities where graceful movement and absolute concentration are prime ingredients. Georgina’s father was born and brought up in Sliema and then moved to San Ġwann before settling abroad in 1978. He pursued a banking career which eventually took him to Gibraltar in 1996 to take up a post of responsibility as a high official. His daughters are all proud of their roots and members of the family are frequent visitors to Malta. While on the island, Georgina, who had developed a childlike en-thusiasm and affection for the sport, would keep up her training chores at a gym in St Andrew’s where she was allowed to train and maintain her fitness. “In Gibraltar I was spotted by a South African coach and ex-Olympian who raised me to the point of Commonwealth Games representation in Delhi where I ranked 15th overall,” Georgina replied when asked about how she started to carve her niche in the sport. She formed part of the Gibraltar team which regularly competes in Spain and the UK. During these competitions the girl caught the eye of the England coach who eventually became the Great Britain mentor. From then on her career blossomed. “I was invited to move to the English team, Bath, where I joined the British squad in February last year. This meant I had to leave school at 17 and relocate myself at short notice. It was a challenge for me. Since then I have been training daily and competing with the British team. “The good news came last month when I was selected for the GB team made up of six girls,” she said with a sense of satisfaction. When asked about her Maltese blood she immediately remarked she was proud of that. “Being half Maltese, I am glad to present myself as both British and Maltese. I feel I not only have the support of one nation, but two. “Also, growing up in Gibraltar means I have an even wider fan base and I hope to do everyone proud this summer,” the slim and elegant-looking girl said. Commenting on the prospects of the British team, Georgina said that basically the girls’ objective is to achieve two clean routines. “We aim to do our best and show Britain and the world what we have been working to achieve,” she said. “Being the first time a GB squad has qualified for the Olympics is not only an achievement in itself. People from three different countries cannot but wish her and the team the best of luck between August 9 and 12 when the women’s individual and group all-around will be held.